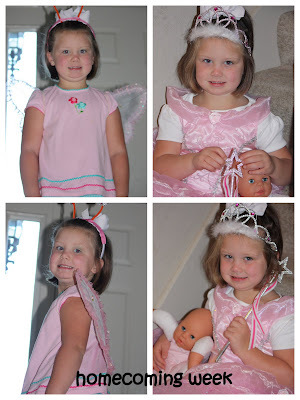 shelly's summary: Homecoming Dress Up Days! This week at Brylee's school is Homecoming. Her school is great about including the preschool and elementary classes into all school activities! So this week was not different! The funny thing is she has NO CLUE what Homecoming is but oh well! Monday was pajama day (no picture from that day... but i think you can visualize). Tuesday was dress like an animal and she picked a butterfly. Yes i know that a butterfly is technically not an animal but it is in her 4 year old mind. BTW she came up with this on her own... and i just noticed the picture cut off her antennas i worked so hard on! :( Wednesday was dress like a prince and princess... she had to take her baby that day too dressed in her princess gown. Thursday was inside out day... she refused to participate that day... she said she was wearing a Mrs. Ashley outfit the normal way! LOL :) Friday is Spirit Day so she will wear her cute little school color outfit her GoGo made her! Fun times! (sorry the pictures are not that great we aren't really "morning people" around here!